A great introduction to Africa, ever smiling Togo is a melting pot of more than 40 tribes that together have managed to create a relaxed yet offhand charm in a country so small you can drive across it in under an hour. Even its biggest city, the capital, Lomé, feels more like a town and is small enough to comfortably traverse on foot. Experience Togolese joie de vivre at the Grand Marche, which occupies an entire city block and sells everything from artisan products to fresh fruit. Better yet head to the Fetish Market, where fetish priests will fix you up with your own protective charm. Voodoo and other animist beliefs are not just for tourists, with half the population following such practices. 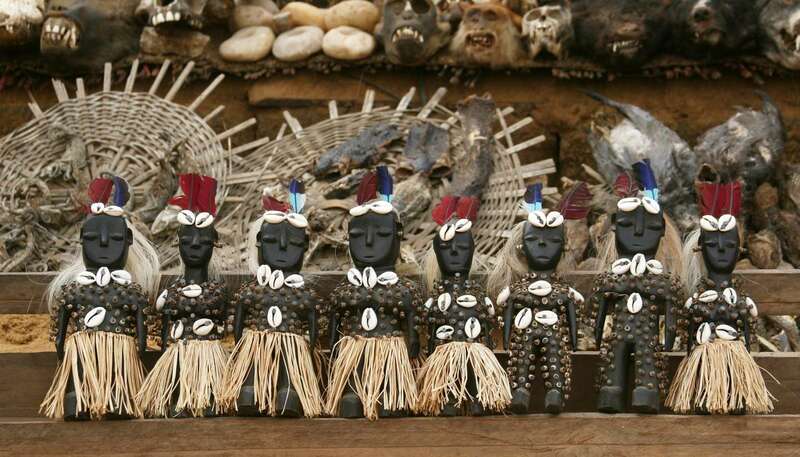 Togoville, on the banks of Lac Togo, is the historic home of voodoo in the country, and is a great place to learn more about religious customs and the meaning of shrines. Meanwhile, the lake itself is becoming something of a weekend retreat for the burgeoning middle-class and its desire for fine food and exciting nightlife. Few leave the palm-fringed Atlantic beaches of Lomé and Aneho, but those who do head off the beaten track and into the hills or savannah will be richly rewarded. The hills offer superb hiking among the dense green foliage of coffee and cocoa plantations, and are where you can find the Kloto carvers, famed for creating multiple connected rings from a single piece of wood. The savannahs of the north, by contrast, offer the chance to witness a more traditional way of life. Considered a symbol of Togo itself, Koutammakou is home to the remarkable takienta mud houses of the Batammariba people, structures that need to be seen to be believed. Togo has a peaceful nonchalance that makes a quick conversation in Lomé’s Grand Marche as much of a highlight as any attraction, while its small size makes travel a relaxed and stress-free experience. 56,785 sq km (21,925 sq miles). President Faure Gnassingbé since 2005. Prime Minister Komi Klassou since 2015, resigned in January 2019. There have been sporadic marches and protests in Lomé and around the country since August 2017, over demands to restore the 1992 constitution. Tensions remain heightened and further marches and protests, by supporters of the government and opposition are likely. You should remain vigilant during this period, avoid crowds and demonstrations, monitor local media and follow advice of local authorities. Tensions remain heightened and further marches and protests, by supporters of the government and opposition are likely. Terrorist attacks in Togo can’t be ruled out. Attacks could be indiscriminate. You should be vigilant, especially in places visited by foreigners. Consular support is limited in Togo. The Honorary Consul in Togo can offer limited consular assistance. British nationals should contact the British High Commission in Accra, Ghana who can provide consular support. In August 2017, at least 2 people were killed during demonstrations over demands to restore the 1992 constitution and a number of arrests were made. Protests by both the opposition and the government have continued sporadically since then, both in Lomé and across the country, with at least 12 deaths and over 80 people arrested. There have been sporadic outbreaks of violence, particularly in the north around the towns of Mango and Sokodé. Political dialogue between the government and opposition is ongoing, but a resolution has not yet been reached and further marches and protests, by supporters of the government and opposition, are likely. You should exercise caution during these times, avoid crowds and demonstrations and monitor local media. Violent crime, theft and pick-pocketing are common throughout Togo and you should be especially cautious in Lomé along the beach and in the markets. Attacks occur during daylight as well as at night. You should avoid travelling alone where possible, even within Lomé city limits, especially at night. You should be alert to the risk of car-jackings, including through staged accidents. It’s generally better not to resist armed attack. British nationals are increasingly being targeted by scam artists operating in West Africa. The scams come in many forms: romance and friendship, business ventures, work and employment opportunities and can pose great financial risk to victims. You should treat with considerable caution any requests for funds, a job offer, a business venture or a face to face meeting from someone you have been in correspondence with over the internet who lives in West Africa. Exit and entry points at borders can be opened and closed at short notice. Be prepared for checks by the local police and military. You can drive in Togo on a UK driving licence for a short stay. If you’re staying longer than 6 months, an International Driving Permit (IDP) is also required. This must be renewed annually. Conversion to a local Togolese licence is not required, although it is possible. You would be required to take a driving test in Togo. Driving standards and road conditions in Togo can be poor. Avoid travelling outside towns and cities at night as roads are poorly lit. During the rainy season minor, unpaved roads may become impassable. You should stop at all control points on request, turn on interior vehicle lights and only continue when permission has been given to do so. You may encounter official and unofficial roadblocks. Take care when using public transport; driving standards and vehicle maintenance are poor. There have been incidents of piracy and armed robbery against large vessels in Togolese waters and those of neighbouring countries. Mariners should take appropriate precautions. You should take care if you decide to swim in the sea as ocean currents are very strong along the coast. There have been a number of drownings each year. The number of British visitors to Togo is low. The main type of incident for which British nationals need consular assistance in Togo is replacing lost and stolen passports. You should carry a photocopy of your passport at all times and keep your passport in a safe place. Consular support is limited in Togo as there is no British Embassy. The Honorary Consul in Togo can offer limited consular assistance. British nationals should contact the British High Commission in Accra, Ghana who can provide consular support. Terrorist attacks in Togo can’t be ruled out. Togo contributes to the UN peacekeeping initiative in Mali (MINUSMA) and may therefore be considered a legitimate target by Al-Qaida in the Islamic Maghreb (AQ-M) and its associated groups. As seen in Mali, Cote d’Ivoire and Burkina Faso, terrorist groups continue to mount attacks on beach resorts, hotels, cafés and restaurants visited by foreigners. Be especially vigilant in these places. British passport holders need a visa to enter Togo. You are advised to get a visa before travel. Visas issued on arrival in Togo are limited to 7 days and getting an extension can be time-consuming. For more information and advice, contact the Embassy of Togo in London. Your passport should be valid for a minimum period of one year from the date of exit from Togo. UK Emergency Travel Documents (ETDs) are accepted for entry to and exit from Togo. Photography near sensitive or government sites, like military installations or the airport, is strictly prohibited. Possession, use or trafficking in illegal drugs is a serious offence and can result in lengthy prison sentences and heavy fines. Homosexuality is illegal. Penalties include fines and prison sentences. See our information and advice page for the LGBT community before you travel. Medical facilities are poor. Emergency facilities are extremely limited. For serious medical treatment, medical evacuation would be necessary. Make sure you have adequate travel health insurance and accessible funds to cover the cost of any medical treatment abroad and repatriation and contact your insurance company promptly if you are referred to a medical facility for treatment. Water-borne diseases (including cholera), tuberculosis, meningitis and malaria are common. The 2015 UNAIDS Report on the Global AIDS Epidemic estimated that around 110,00 adults aged 15 or over in Togo were living with HIV; the prevalence percentage was estimated at around 2.4% of the adult population compared to the prevalence percentage in adults in the UK of around 0.2%. You should exercise normal precautions to avoid exposure to HIV/AIDS. Togo is a cash-based society and credit cards are not universally accepted, especially Mastercard. There are some ATMs at major banks in Lomé, dispensing local currency (West African CFA). Take care when using your credit card or an ATM.